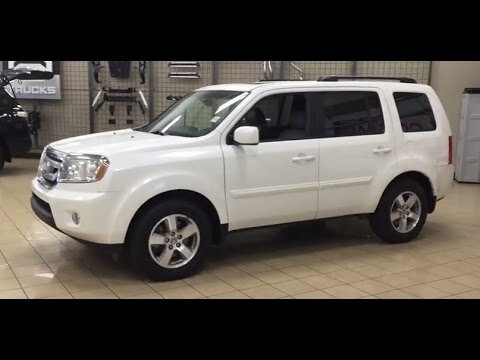 If you're looking for a true eight-passenger vehicle that offers more on- and off-road capabilities than a minivan, the 2011 Honda Pilot belongs on your list. It can accommodate three child seats in the second row and comfortably fit two adults in the third-row seat. Very versatile with all the luxuries. So far my 2011 Honda Pilot has not given me any problems. I had a 2005 Honda Pilot before this one that had well over 100, 000 miles on it. I love the Honda Pilot. It seats 8 and is versatile in its seating arrangements. My Pilot has heated leather seats, rear DVD player, sunroof, backup camera. There is plenty of legroom and storage space in the Honda Pilot. It is AWD which is great in the winter weather. I absolutely love my Pilot and will always own one. It fits my dogs in the back nicely when I fold down the third row. I have a great dane and an American bulldog/boxer mix. We have 3 sons who play sports and it fits there equipment in the back nicely. I can fit bikes in the back to but I love that is has a hitch and I bought a bike rack to tow the bikes easily. It also has the roof rack to which I bought a storage rooftop carrier for which enables us to still fit 8 people and keep our luggage on top. I have taken my Pilot on so many road trips all over the us. I highly recommend it to anyone! I really like the glove box and the storage above it. This is my 2nd Honda pilot. I loved my 1st Honda pilot it was 2006 and I drove it to 200, 000 plus miles on it when I traded it in for this one. The inside on the 2011 Honda pilot is so much nicer. It drives good but I must say the get up on it is not as good as the one in 2006 I could press on the gas in my old pilot and it would go. The 2011 I think because it is such a bigger vehicle or seems to be it takes much longer to accelerate to a speed. I feel like the seating in my 2006 was much more comfortable. They were both leather my 2011 pilot is comfortable but just because I have had a 2006 I know those seats seem to be more comfortable and not so stiff. I do love my 2011 better over all. I love the way that it looks! I love the DVD player! If I could make a suggestion I wish that I could listen to music in the front while my kids could listen to the DVD in the back. I love the navigation! I love the camera! I love the space! My vehicle is an EX-L model. I especially love that the dual front seats are both power and heated. I recently have used the available 3rd row seating for transporting my kids and their friends. Everyone one had plenty of room and we were able to get 8 passengers in our car. The heated mirrors are great in a New England winter. The split hatch is a excellent, my previous Pilot did not have that and trying to fit tall items in the car was a pain. Now I can leave the glass open and the item just sticks out with the hatch closed. The only thing I am disappointed in is the issue with the spark plug misfires that make the car "jump" while driving. This is a warranty issue they have fixed once but it didn't last. Apparently I need to go in and have a piston ring job to completely fix the problem which they say should be covered under the extended warranty.